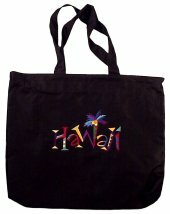 Waikiki.com is proud to introduce our newest line Hawaiian Embroidered Large Tote Bags. 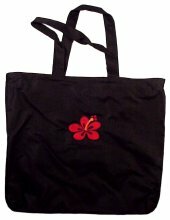 Made from durable canvas and embroidered with Hawaii and a Hawaiian Red Hibiscus. Great for taking to the beach, a weekend bag or the gym. We also have a Hawaiian Sport - Hibiscus Navy Print Water Bottle. Order Online today!